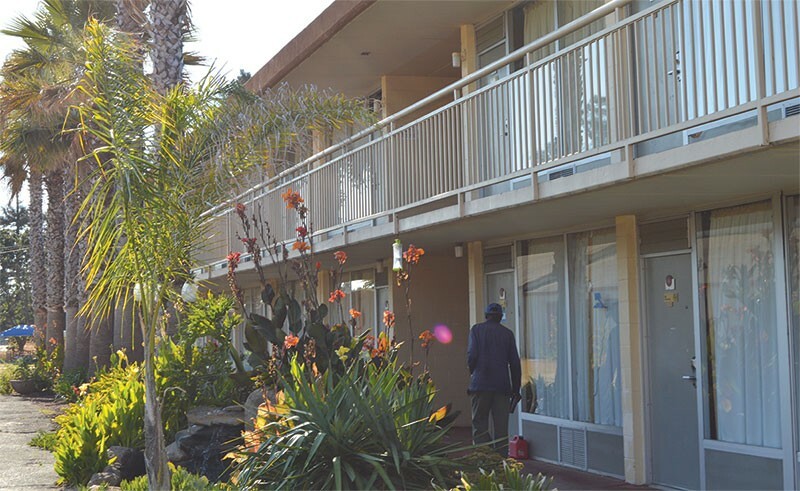 HOUSING THE HOMELESS Seven residents at Santa Rosa’s Palms Inn died last year, unfortunate but not surprising given the at-risk population served by the innovative housing project. It's a quiet weekday morning, and there's a lull in the rain at the Palms Inn in unincorporated Santa Rosa. Roy Burress is volunteering at the converted motel's cafe-bookstore and talks about the deaths of residents that have taken place here in recent months. He's bearded and wears glasses and a baseball hat from the USS Theodore Roosevelt. Burress is a Vietnam veteran and one of 114 residents at the Palms Inn, which was converted into apartments for the formerly homeless last year to much fanfare from local housing activists and Sonoma County officials. They heralded the Palms project as a key piece of the county's push to deal with its stubborn homeless problem. Burress rattles off the fatalities he's aware of among residents here—seven of them, he says, including an overdose and a suicide, in 2016. He speaks of at least one former tenant who tried to better himself but gave into his pain and ended up taking his life. He remembers others who arrived at the Palms with terminal illnesses. "They were going to die." With a minimum of red tape and a full acknowledgement of the county's homeless crisis, the Palms Inn opened last summer within three months of its conception as a go-to residence designed to siphon county residents off the streets and into some semblance of normalcy. Based on the nationally renowned "housing first" model, the Palms project has found housing for a client base that is split between veterans and referrals from Catholic Charities; the latter are generally considered a more vulnerable and needy population. But months into the Palm's grand opening, the fatalities lend to the question of whether the Palms is set up to handle its de facto role as hospice caregiver—a role that was considered but not codified into any specific policy as the Palms was moving toward its opening last year. According to the Sonoma County Sheriff's Office, two deaths occurred on-site at the Palms in 2016 and one was a suicide. An administrator at the facility confirms that there have been fatalities among the residents this year—the others died after being transported to a hospital—and that the Palms is geared up to spring into action when there's a death and take care of residents who might be distressed. And yet, even as it has offered transitional or long-term housing for forward-looking formerly homeless people, it's not surprising that some residents who arrive at the Palms might soon die at the Palms, says Holmes. "We are screening the most vulnerable people, people with severe physical and mental-health needs," she says. "People who were terminally ill, we brought them here. Otherwise they would have died on the streets. At least they get end-of-life care here." Some tenants receive in-home services subsidized by the state and administered by the county. Holmes highlights findings from resident surveys this year which found that residency at the Palms had served to push back the numbers on several key arbiters that typify life on the streets, all of which saved taxpayers money. According to the survey, admittance to the emergency room and in-patient hospitalization fell by 45 percent; interactions with law enforcement dropped 77 percent; ambulance transportations fell by 56 percent; and usage of crisis service interventions such as suicide hotlines went down 98 percent. The seven deaths, Holmes says, are "below the average of other housing first programs and we are targeting the most vulnerable homeless individuals in Sonoma County." The survey reveals most residents are taking advantage of the roof over their heads, even when they arrive with significant health problems. For some residents, an expected or imminent death is a part of life at the Palms. "But this is normal, and it's important to provide this level of care to individuals," Holmes says. Holmes further highlights the "revolutionary" aspect of the program that helps enhance care for residents. Many signed up for Medicare and Medicaid when the program was getting off the ground last summer. "The relationship to health and homelessness is just huge," Holmes says as she credits the much-maligned Affordable Care Act with helping to ease the strain on homeless people turning to the emergency room for primary care. "The ACA has really allowed us to get people in medical [facilities], where before they would show up in the emergency room," Holmes says. "It's been pretty huge to the people who we serve," she adds—including those who die, who at least pass with some semblance of dignity, instead of in a Fourth Street alcove huddled against the wind and the rain. "A person who is homeless," Holmes says, "has no access to hospice."